Boy how fast a week goes by, and before I knew it it was time for me to select my second produce box. I am researching Bay Area organic produce delivery services, trying them out one week at a time, and ranking them one by one at the end of ten weeks. First impressions may not be everything, but they sure do say a lot. 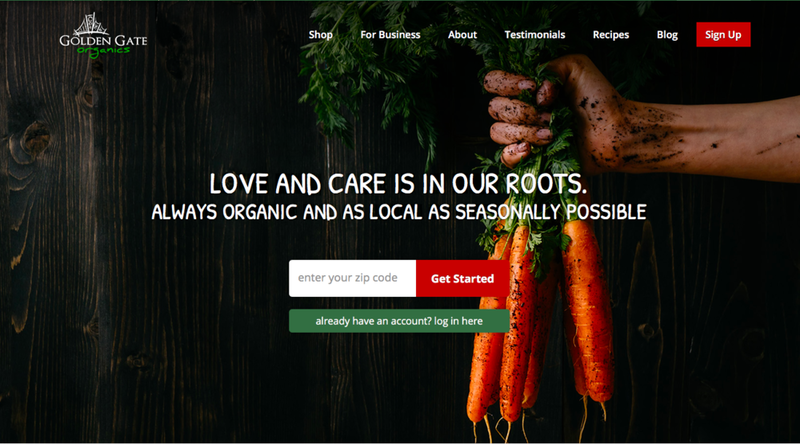 When I opened up the Golden Gate Organics website the homepage background showed a photo of a hand grasping a bunch of freshly picked carrots, the dirt still trickling off of them. The brand message was bold and clear on the website: Love and Care Is In Our Roots. There is no contract required at Golden Gate Organics which is perfect for my project, so I entered my zip code and created my account. I popped a batch of granola I was making out of my oven to munch on, took a seat at my kitchen table, and got to building my produce box for my Golden Gate Organics review. The homepage of Golden Gate Organics. Step One: Enter my zip code. For this Golden Gate Organics review, I chose the small family box of fruits & veggies for $40. I viewed the sample box that was shown on the website, and the quantity of produce that was listed looked comparable to that of Farm Fresh To You. I couldn’t wait to see for myself how it measured up value-wise. I also noticed the wide variety of produce options that may arrive as part of my box. 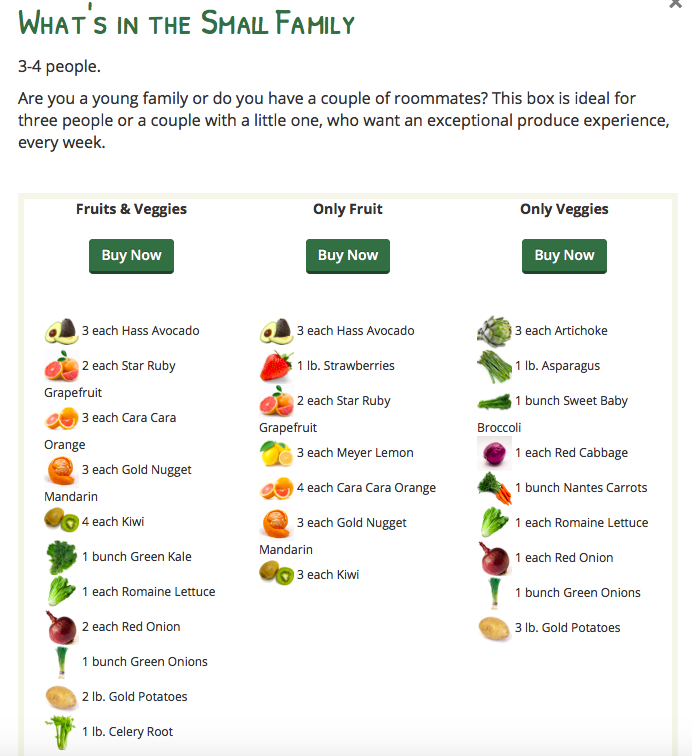 Upon check out, I learned a bit about their Coop program - I could save 10% on every delivery if I just pooled a few friends or neighbors and had the group pick up their weekly produce boxes from one designated locale. Not long after I placed my order I received an email from Golden Gate Organics providing me with all sorts of informative facts about the week’s produce. I also learned that I could make changes to my CSA order up until midnight the day before delivery. As mentioned in my Farm Fresh To You review, I had the option of adding on a range of other products, from dairy to tea, but I passed on this option once again. I’ll have to try adding on to an order for a future review. Add or skip deliveries up to three months in advance within "Your Schedule"
Change delivery instructions or let us know you are going to leave a cooler for us to pick up under "Account Info"
I was told via email that my box of produce would be delivered between 7am and 6pm. If I left home, I should leave a cooler outside so the produce could remain chilled. Kiwis: 4 - I did not realize kiwis were grown locally but I am excited to know that now. These juicy snacks are the perfect go-to on a hot California day. Red Cabbage: This head of cabbage shined purple. I can’t wait to slice into it. Take a look at one way to prepare a beautiful head of cabbage here! Gold Potatoes: There were 8 medium potatoes in total. I loved the skin color of these. Potatoes sometimes get a bad rap because they are considered a ‘white’ food (white bread, white rice, etc), but take a look at the skin on these beauties and then get back to me! Cara Cara Oranges: 3 in total. Smooth, round, and perfectly ripe! Green Onions: This bunch had six stalks in total - what a delicious side dish they will make. Hass Avocados: 3 in total. I always purchase avocados from the grocery, so I am looking forward to trying these from the farm. Green Kale: A medium sized bunch - perfectly uniform with their deep, dark-green color. Romaine Lettuce: At first glance, I noticed the shape of these leaves were a bit different than the ones available to me at the store - they flared out at the top and were darker as well. The rich colors of a head of red cabbage have always entranced me - it contains a pigment called anthocyanin, which indicates the acidity of the soil in which the cabbage has been grown. A red hue means the soil was more acidic, purple if the soil had a neutral pH, and yellow/green if it was alkaline. I had to clear some extra space in my fridge to make room for this bountiful delivery. Golden Gate Organics produce in my fridge. I immediately organized my oranges and kiwis in a bowl and set them towards one corner of my refrigerator shelf. They made the most perfectly healthy and quick snacks to munch on throughout the week. I tucked the onions and avocados in one of the bottom drawers of my fridge. I usually leave my avocados on the counter to fully ripen however I knew I was not going to eat these three for a few more days so I decided to keep them chilled. The Cara Cara Orange was a lighter, milder citrus between the two. It was a little tart. The Golden Nugget Mandarin had a bolder and richer flavor. It was almost as if it were heavier in taste - as far as oranges are concerned. Half of the large head of romaine lettuce became a simple salad dressed with extra virgin olive oil, lemon juice, salt and pepper. The remaining leaves made the most perfect boat-shaped holders for a thin spread of hummus, sprinkled with some sliced red onion. These served as great appetizers throughout the week. Here are a few meals I prepared using the different produce I received for my Golden Gates Organics review. Whenever possible I like to massage my kale before consuming it. Being a fibrous vegetable it is sometimes harsh on my digestive system. So after a quick wash, I tore the leaves into bite-sized pieces, drizzled them with a tbsp of extra virgin olive oil and the juice from half a lemon, and used my hands to squeeze the leaves for about three minutes. This completely changes the texture of the kale from fibrous to silky and soft. I sliced some red onion and dried figs, added a sprinkle of raw sesame seeds, salt and pepper on top, and I was ready to rock. When I first saw 8 Golden Potatoes included in my Golden Gate Organics review box, I knew I had to slice at least a few of them up Hasselback style. I have been enjoying this method as of late. Post roast, the skins become nice and crispy and the insides stay soft. I chose to accessorize these potatoes with green onions that I roasted in the oven as well. I enjoy the sweet flavor that the roasting brings out of green onions. The two paired nicely together and resulted in an easy, simple, and satisfying lunch. I enjoy a shift in flavor profile especially after dinner, so I am always thinking about desserts I can make that are free from refined sugars. Avocado Mousse had been on my mind so I figured this would be a great time to create it using some of the avocados I just received. I grabbed two of the avocados, peeled and blended them up with 1/2 cup raw cacao powder and 1/4 cup of unsweetened almond milk. I also added 2 tbsps of raw honey to cut through the bitterness of the cacao. Granted, I have not eaten a mousse in a while, but I feel pretty good about the consistency of this one. My dessert was filled with healthy fats that my body needs. Plus, it was dairy-free! All in all my Golden Gate Organics review was such a seamless experience from placing the order to receiving my box. I was extremely satisfied with the email communication and information provided by the company. The customization and cancellation processes were also very simple to complete and neither took up too much of my time. All of my produce arrived fresh, and the box was bountiful. There was a solid mix of vegetables and fruit. I therefore was able to create multiple meals using the produce, and it lasted me just about a full week. Find out my Golden Gate Organics ranking here!